CONROE, Texas – March 13, 2019 – The 35th annual Young Texas Artists Music Competition culminated on Saturday, March 9, with the highly anticipated Finalists’ Concert & Awards at Conroe’s Crighton Theatre. The event featured CEO of Steinway & Sons Ron Losby, who flew in from New York City, as guest of honor and drew a full house. Young Texas Artists’ three-day competition leading up to the concert and awards event saw musicians ages 18-30 (ages 20-32 for Voice) who are Texas residents or affiliated with a Texas university or school of music competing in one of four divisions: Voice; Piano; Strings; and Winds, Brass, Percussion, Harp and Guitar. Finalists in each division vie for the opportunity to compete for a share of $20,000 in monetary prizes and performance opportunities. Young Texas Artists President/CEO Susie Pokorski attributes much of the consistent excellence of the competition to Artistic Director Emelyne Bingham, an internationally known conductor, musician, lecturer and music professor at Vanderbilt University. “Her knowledge, passion and input—combined with her empathy and dedication to our competitors—has a tremendous impact on the quality of our competitions and our ability to provide meaningful support to young artists,” Pokorski said. Immediately following the annual Bach, Beethoven & Barbecue benefit gala, co-chaired by Terry Husbands Giles and Allyson Ayton, the Finalists’ Concert & Awards was led by Mistress of Ceremonies Jade Simmons. The concert pianist, professional speaker, media personality and emerging artist specialist also conducted the finalists’ interviews onstage. This year’s competition featured 70 contestants, including international musicians from Canada, China, Italy, Mexico, Poland, Russia, Slovenia, South Korea, Spain, Taiwan and the United Kingdom. In addition, Texans studying outside the state at Cleveland Institute of Music, Indiana University, Louisiana State University, Michigan State University, New England Conservatory of Music, University of Hartford and the University of Louisville came “home” to be a part of the event. The 2019 Grand Prize winner was Russian pianist Artem Kuznetsov, who accepted his award from Susie Pokorski and Young Texas Artists Co-Founder Jim Pokorski. Kuznetsov also received the Gold Medal in the Piano Division with his performance of “Piano Concerto No. 1 in B-Flat Minor, Op. 23 – III. Allegro con Fuoco,” by Pyotr Ilyich Tchaikovsky. The Gold Medal was presented by Ron Losby and one of the 2019 competition judges, William Wellborn, pianist and faculty member at the San Francisco Conservatory of Music. A native of Balashov, Russia, Kuznetsov is a graduate student at Rice University’s Shepherd School of Music, studying under Jon Kimura Parker. He has performed as a soloist and a chamber performer across Europe and the United States. Throughout 2017-2019, he has participated in outreach recitals for underserved communities in Texas and Washington State and has given more than 35 presentations and masterclasses for elementary, middle and high school students. Kuznetsov also is the recent recipient of the grand prize at the eMuse International Music Competition and top prizes in the Ivanovka International Piano Competition, the Naftzger Young Artist Competition and the Seattle International Music Competition, among many other respected competitions. During Young Texas Artists’ awards presentations, Kuznetsov was presented with a Texas flag provided by Texas State Sen. Brandon Creighton. The flag was flown over the state Capitol building on March 2, Texas Independence Day. Mezzo-Soprano Brennan Blankenship’s performance of “Sein wir wieder gut” from Ariadne auf Naxos by Richard Strauss earned her the Gold in the Voice Division, presented by North Carolina Opera General Director Eric Mitchko and Missouri Symphony Orchestra Conductor Kirk Trevor. Both presenters were on Young Texas Artists’ 2019 judges’ panel. Blankenship—a resident of Spring, Texas, who also was Young Texas Artists’ 2017 Gold Medalist in Voice—received a Bachelor of Applied Music, Vocal Performance, from Pepperdine University in 2012; a Master of Music, Vocal Performance, from University of Minnesota Twin Cities in 2014; and reached Level B1 at Arca Italian School in Bologna, Italy, in 2016. The Strings Division Gold Medal went to cellist Lukas Goodman, who performed “Concerto in B minor for Cello and Orchestra, Op. 104, B. 191-I. Allegro” by Antonin Dvorák. Presenting the award were Young Texas Artists Artistic Director Emelyne Bingham along with San Francisco Opera Orchestra Concertmaster and 2019 Young Texas Artists Judge Kay Stern. Goodman, who is from Winchester, Massachusetts, is studying Cello Performance at Shepherd School of Music. He is a former member of the Boston Youth Symphony Orchestra and attended the Heifetz International Music Institute at Mary Baldwin University in Staunton, Virginia. Flutist Won Lee of Carrollton, Texas, was named the Gold winner in the Winds, Brass, Percussion, Harp and Guitar Division with his performance of “Concerto for Flute and Orchestra No. 2 in D Major K. 314 – I. Allegro aperto” by Wolfgang Amadeus Mozart. The award was presented by Young Texas Artists 2019 Judge Diane Schultz, professor of flute, School of Music at The University of Alabama, and Young Texas Artists Board Chairman Richard Griffin. Lee received his Bachelor of Music from The University of Texas at Austin in 2011, his Master of Music from Peabody Institute of The Johns Hopkins University in 2013, and a Professional Studies Diploma from the San Francisco Conservatory of Music in 2016. Currently, he is working toward his Doctor of Musical Arts at the University of North Texas. Silver medals went to: John Belk, cello, Strings Division, Rice University; soprano Bronwyn White, Voice Division, Texas Christian University; Vincent Ip, Piano Division, Rice University (also a professional figure skater who has toured Europe); and Zhi-Yuan Luo, clarinet, Winds, Brass, Percussion, Harp & Guitar Division, The University of Texas at Austin. Luo’s performance of “Rigoletto Fantasia for Clarinet and Piano” by Luigi Bassi, earned him the Audience Choice Award, which was presented by Planet Lincoln General Manager John Dvorak and his wife Cheryl Dvorak. Planet Lincoln was a major sponsor of the event. Each Gold medalist received $3,000, Silver medalists received $1,000, the 2019 YTA Grand Prize winner received an additional $3,000, and the winner of the Audience Choice Award received an additional $1,000. The Grand Prize winner also will be invited to perform with the Texas Medical Center Orchestra and the Allen Philharmonic Orchestra & Symphony Chorus. Finalists are often invited to perform with other Texas arts organizations, such as the Conroe Symphony Orchestra, the Montgomery County Choral Society and The Woodlands Symphony Orchestra, as well. Major sponsors of the evening, in addition to Planet Lincoln (planetlincolnspring.com), were Dr. Douglas and Carol Aycock, Lynda and Dan Kain, Amy and George Sowers, April Sound Country Club (aprilsound.com), and the Conroe Convention & Visitors Bureau (visitconroe.com). For more information about Young Texas Artists and sponsorship or volunteer opportunities contact Susie Pokorski at susiepokorski@gmail.com or 936-756-7017. 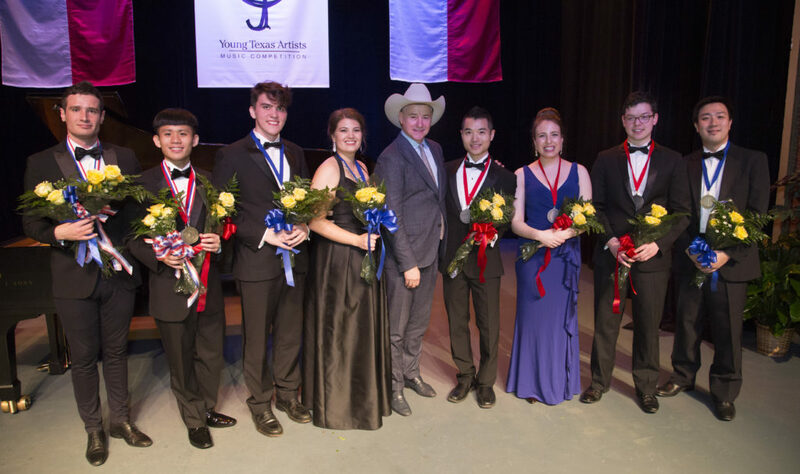 An official music competition of the State of Texas, Young Texas Artists has, since its founding in 1983, encouraged excellence in young musicians, inspired their audiences and helped further the careers of thousands of classical musicians. It is one of the few competitions in the country that features four divisions: Voice; Piano; Strings; and Winds, Brass, Percussion, Harp and Guitar. This Texas competition for Texas artists has helped produce many distinguished professionals who have gone on to join orchestras, opera companies, universities and music schools around the world. The Young Texas Artists Music Competition is a member of the Greater Conroe Arts Alliance, the Conroe/Lake Conroe Chamber of Commerce, the Texas Cultural Trust and Texans for the Arts. youngtexasartists.org.